POM Wonderful is a global brand committed to innovation and wellness. We grow and market high quality and delicious pomegranates and pomegranate‑based products. If you are interested in learning more, please visit either our US or Europe POM Wonderful websites. Email our sales team at [email protected] for more information. ©2016 POM Wonderful LLC. All Rights Reserved. POM, POM WONDERFUL, WONDERFUL, POM POMS, SUPER TEA, the Bottle Designs, accompanying logos, trade dresses and all other intellectual property on this website are owned by POM Wonderful LLC or its affiliates. Please read these terms and conditions before using this Service. The Site contains information about POM Wonderful pomegranates and POM Wonderful juice and tea products, including, but not limited to, nutritional information, promotional and other offers, menu and recipe ideas, and information on where you can buy POM Wonderful beverage products, as well as the history and growing of pomegranates. We do not guarantee that you will have any recourse through us or our affiliates to edit or delete any Content you have submitted. We reserve the right to remove or to refuse to post any submission or Content for any reason. You acknowledge that you, not POM Wonderful, are responsible for the contents of your submission. None of the Content that you submit shall be subject to any obligation of confidence on the part of POM Wonderful, its agents, parent, subsidiaries, affiliates, partners or third party service providers and their respective directors, officers and employees. By submitting your e-mail address in connection with your submission or posting of any content, you agree that POM Wonderful and its third party service providers may use your e-mail address to contact you about the status of your submission and other administrative purposes. 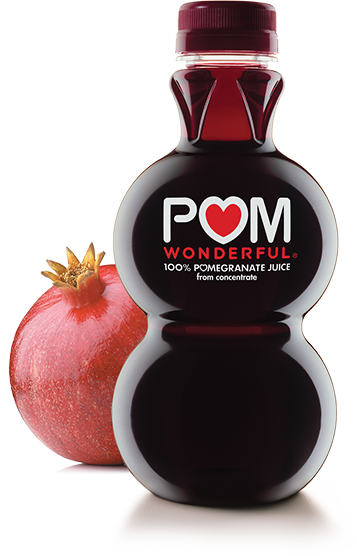 POM, POM WONDERFUL, WONDERFUL, the Bottle Designs, accompanying logos, trade dresses and all other intellectual property on the Site are owned by POM Wonderful LLC or its affiliates. © 2015 POM Wonderful LLC. All rights reserved.